Were you enrolled in our medical plan at the time of your retirement? Was your spouse enrolled in our medical plan at the time of your retirement? Do you currently receive a financial benefit to offset your medical expenses and how much is that amount? HRA stands for Health Reimbursement Account. It is an account used to pay medical costs of retired clergy: supplemental Medicare coverage, prescription coverage, and out-of-pocket medical expenses. The Oklahoma Annual Conference has funded an HRA for retirees (and an additional HRA for their spouse) if they were enrolled in our medical insurance at the time of retirement and had at least 5 years of service in the Oklahoma Annual Conference. What is the difference between HRA and my pension? The HRA is a benefit provided by the Annual Conference. Your pension is provided by Wespath (formerly the General Board of Pension and Health Benefits). Your HRA can only be used for medical costs. Your pension is the monthly income you receive from Wespath. Will my pension be reduced as a result of Annual Conference action? Your pension (the monthly income you receive from Wespath) can never be reduced by Annual Conference or General Conference action. It was a benefit promised to you when you retired. No Annual Conference action can reduce your pension benefit. The only way your pension payment can be reduced is if Wespath becomes insolvent. Will my pension be increased as a result of Annual Conference action? For those with years of service acquired before 1982, Annual Conference action can increase your pension payments. This happens when the Annual Conference votes to increase the Past Service Rate (PSR). This action can never be reversed. So, if you receive an increase, it is promised to you for the rest of your life. What is the PSR and how does it work? The PSR (Past Service Rate) is the number set by the Annual Conference to determine a retiree’s annual benefit for years of service acquired prior to 1982. Take the number of years served prior to 1982 and multiply that by the PSR. That is your annual pension payment. The Annual Conference will receive a recommendation to raise the PSR for 2020 to $698. So, if you served 18 years prior to 1982, your calculation would look like this: 18 years x $698 = $12,564/year. Will the contribution to my HRA be reduced as a result of Annual Conference action? If you retired prior to or at Annual Conference 2004, your HRA contribution remains unchanged. Did you have 20+ years of service with the Oklahoma Annual Conference? If yes,you will receive a reduced HRA contribution of $1,400/year. If your spouse receives an HRA contribution, he/she will receive $1,400/year in his/her HRA. Why is Annual Conference action necessary to reduce HRA retiree contributions? Providing this cash benefit to offset medical expenses for retired clergy must be funded through apportionments each year. In 2018, the cost of this benefit was right at $1.5 million. In 2019, we are projecting an increase to $1.7 million. As the number of retirees increases, the cost of providing this benefit increases. With declining numbers of churches and reduced apportionment income, we can no longer afford to pay for this benefit at its current level. The Board of Pension and Health Benefits decided to reduce this benefit for those who retired in the last 15 years because their pension income is typically higher than those who were serving prior to 1982. We tried to protect the retirees among us who are the most financially vulnerable. Will the Annual Conference need to reduce the HRA contributions further in the future? No one knows the future. This benefit (unlike your pension) is approved each year at Annual Conference. So, we’ll have to keep a close eye on income through apportionments and make a decision about whether we can afford it each year. It is certainly a possibility that this could be reduced further in the coming years. What assumptions were used to come up with the new, reduced HRA amounts? We began with the same general assumption used to determine how much active clergy must pay for health care. This cost is shared between the clergy person and the Annual Conference (employer) in a 50/50 split. The average cost of the Medicare supplement, Plan F is $228/month. If a retiree pays half, then the retiree should be responsible for $114/month. That leaves $114/month to the Annual Conference. Annualized, this amount is $1,368. We rounded up to $1,400 and are recommending this as the HRA contribution rate for those retiring within the last 15 years. This rate reduction would take effect Jan. 1, 2020. Will retirees be able to receive a health screening at Annual Conference 2019? Yes. More information will come out in an email closer to the date of Annual Conference. Is the Annual Conference required to provide health insurance for clergy? Why did we remain self-funded for so long when we were losing money? When the Annual Conference approved a self-funded plan for all full-time, appointed clergy, this was the cheapest option available. In the initial years of this plan, it did save the Conference money. And, in the years when the plan received more revenue than was required to pay claims, keeping the surplus was a real benefit. The last year the plan showed a surplus was 2014. Every year since that time, the plan has lost money. As of Jan. 1, 2015, the plan had almost $7 million in reserve. Over the next four years, we lost $5 million -- ending 2018 with $1.9 million in reserve. In the fall of 2018, the Board of Pension and Health Benefits determined we must have more revenue to the plan or risk insolvency in 2019. The amount being direct billed to churches was increased from $580/month to $780/month as of Jan. 1, 2019. It will be increased again to $980/month as of July 1, 2019. We remained self-funded because it was the less expensive option. We spent down our reserves. 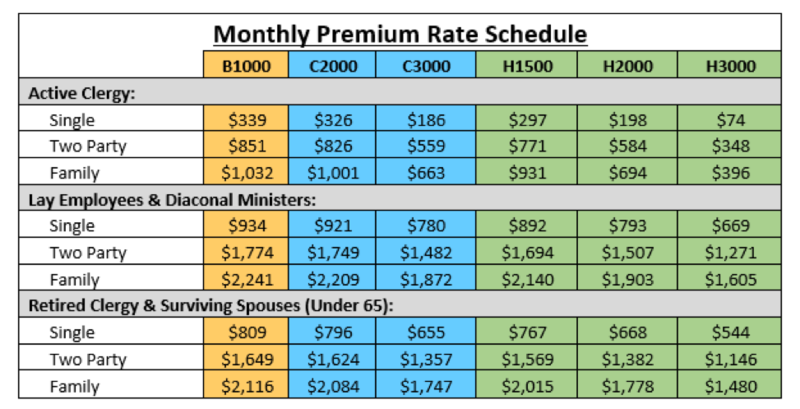 As we prepare to move to a fully insured plan, our church contributions are at a level commensurate with what is needed to pay for this benefit. Why can’t we just give clergy a stipend to purchase their own health insurance? We can do this and still meet the requirements of the Book of Discipline. Four annual conferences are doing this, although two of those are currently considering moving back to a fully insured plan. The Board researched this option and discovered that it would not be cheaper for local churches. The amount of the stipend would need to be close to the amount currently being direct billed to churches in order to allow most clergy to purchase health insurance on the government exchange. In addition, there were several disadvantages to doing this. The stipend is taxable income. Since clergy are self-insured and must pay the full SECA rate of 15%, this would automatically reduce any stipend paid to them by that amount. The cost for purchasing health insurance would vary widely for clergy. On the exchange, premium costs for older clergy could be twice as much as those for younger clergy. Difference in premium costs would accelerate the wide disparity between clergy income. It could affect appointment considerations. Clergy would find it cheaper to purchase coverage in a metro area than in a rural area. Moving mid-year might mean a clergyperson could find it hard to access coverage in the new location until enrollment allowed a change in plans. There would be no way to make sure clergy purchased health insurance with the stipend, leaving those who don’t without insurance. There would be no way to make sure the local church paid the stipend to the clergy person since it wouldn’t be direct billed through the Conference Office. Choosing the right plan on the exchange is not simple and many clergy express that making elections in our current system is confusing. Creating a situation where clergy must do this on their own would mean that many might choose a coverage level that is below what they truly need and others might choose to risk being uninsured. Will clergy have to participate in the new insurance program? Yes. And, just to make sure it is clear -- yes, all full-time, appointed clergy will have to participate in the new insurance program. You cannot opt out. How will the new insurance program compare to what we have now? The Board is recommending a switch to Health Flex, the fully insured program offered through Wespath. If we make this switch, the amount being direct billed to churches will remain at $980/month for each full-time, appointed clergy person. There are six different plans to choose from. For a coverage level similar to what a clergy person currently has, premiums should be similar. However, all plans include basic vision, behavioral health coverage and access to an Employee Assistance Program (EAP). 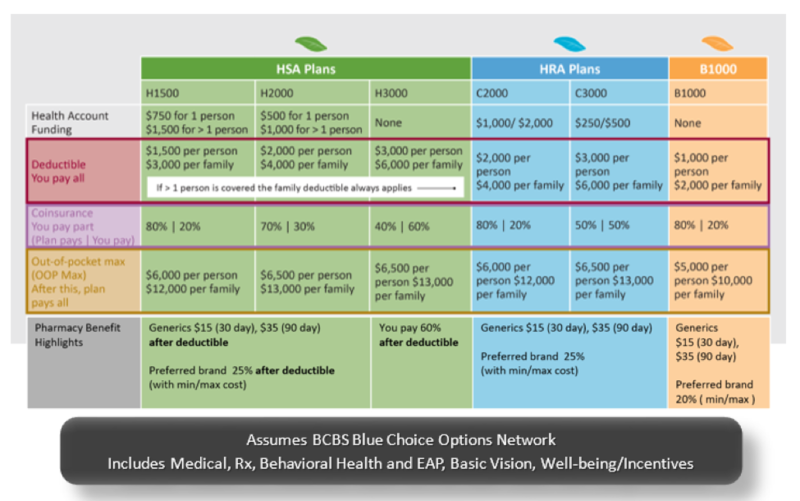 Please refer to the following charts: More detailed information about the specifics of each plan will be provided at the fall benefits symposiums. When we will get information about how to enroll and options for coverage? The Benefits Symposiums this fall will focus on Health Flex and fully explaining the program. The dates and locations of the Symposiums should be available by late summer, early fall 2019. Attending a Symposium will better equip you for enrollment choices on our new plan. Please be aware that the open enrollment period for HealthFlex is only two weeks long. We’ll keep you informed via email, but you need to make your decisions earlier this fall and be ready to enroll when the enrollment window opens. If you don’t enroll, the Plan H1500 will be chosen for you by default. What about the wellness plan? HealthFlex includes a wellness component. Instead of receiving premium credits, the plan offers cash incentives for participants up to $410/year. Many have asked if the wellness points earned in 2019 will count toward 2020 incentives and the answer is NO. It is always a good idea to take advantage of the wellness program, but it won’t count toward incentives next year. For this reason, we are not offering health screenings for Active Clergy at Annual Conference in 2019.